World Circular Economy Forum 2017 not only presents the world’s best circular economy solutions – it is also sustainable by design. The principles of circular economy are at the heart of planning and producing the event. Recycling and minimising waste, re-thinking and re-using materials and relying on digital solutions are at the core of World Circular Economy Forum (WCEF2017). “We are aiming at 100 % circularity in the production of the event. This makes World Circular Economy Forum 2017 one of the most ecological events in the Nordics ever. The starting point is that we use and produce only what we need in order to make the event successful, nothing more”, says Mikko Noronen, Managing Director of the event planning company Factor Nova Oy. All furniture and fixtures used are rented from the venue or from local rental companies. Nothing is produced just for this event. 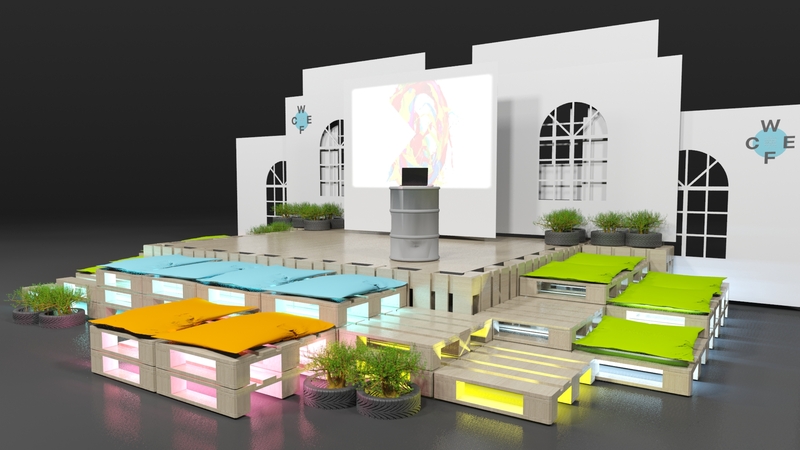 Other elements are planned and produced from materials that have had a life before and will have a life after the event such as pallets and tent fabrics which are used in new and innovative ways. For example, all the signposts and logo signs used at WCEF2017 will be re-used as signposts at a large Finnish rock festival, Ruisrock, during the summer. “In the event planning, even the small details have been re-thought. We use a lot of digital tools instead of printed materials”, Noronen points out. The WCEF2017 mobile application will be launched in May. It helps participants get the most out of the event programme and to make better connections with other attendees. Finlandia Hall, the venue for World Circular Economy Forum 2017, is among the first event centres in Europe to utilise solar energy for the energy needed in the premises. 180 solar panels were installed on the roof in December 2016. The electricity provided by the system is estimated to cover a maximum of 20-25 percent of Finlandia Hall’s total energy consumption during the sunniest days of summer. “I hope we can set a good example. Corporate social responsibility and environmental responsibility are very important to us”, says event coordinator Ria Ahlström from Finlandia Hall. All waste generated at Finlandia Hall is always sorted and recycled. The heating, air conditioning and lighting of the property are controlled individually for each space to save energy. Energy-efficient LED lights provide lighting and water consumption is minimised. The restaurant at Finlandia Hall opts for seasonal, local and organic products when possible and there are always vegetarian options available. “More and more event organisers are asking for environmentally friendly solutions and sustainability is definitely an asset for us”, Ahlström says. The participants of World Circular Economy Forum 2017 can also do their share to make the event more ecological. The organisers recommend compensation for the CO2-emissions of flights. Different options are mentioned on the event website as well as recommended hotels, which all have an environmental certificate and are committed to minimising environmental stress and to developing sustainable solutions. “Circular economy is a new way of thinking also to us as an event producer. We are really looking forward to World Circular Economy Forum and a new, more sustainable way of producing events”, says Mikko Noronen from Factor Nova.